Apple lived up to its word on Sunday by closing down its MobileMe service, though it is allowing users to move their accounts to iCloud or download photos and files for a "limited time." A closed sign appeared on Apple's Me.com website over the weekend, as noted by MacRumors. The page now contains links for migrating an account to iCloud, downloading photos from Gallery and downloading files from iDisk. 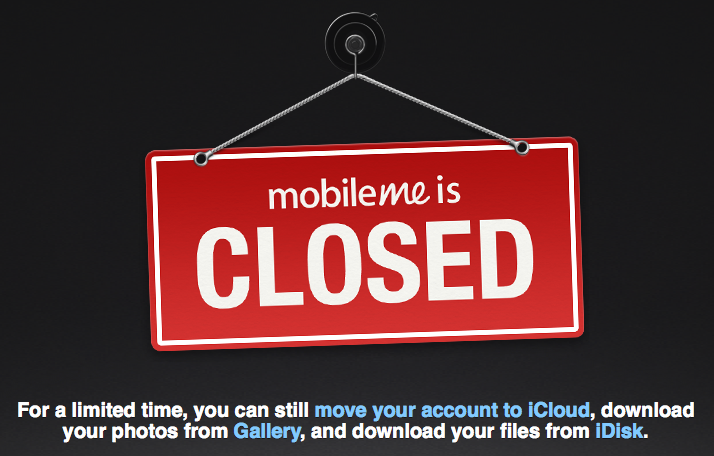 After announcing its replacement iCloud service, the Cupertino, Calif., company warned last June that it would sunset MobileMe on June 30, 2012. It sent a reminder to users early last month of the impending shutdown. In order to help entice remaining customers to move to iCloud, Apple has extended free storage upgrades and even given out free copies of OS X Snow Leopard to some users. In May, the company published a FAQ informing customers that if they had already purchased 20GB of storage from MobileMe they would receive the same amount of storage in iCloud until September 30, 2012. OS X Lion users have reportedly been offered free copies of Snow Leopard so they can install the Mac App Store and upgrade to Lion, which is required for some of iCloud's features. Apple re-upped its commitment to iCloud last month at its Worldwide Developers Conference in San Francisco, Calif. The company announced there that iCloud will gain Notes and Reminders syncing later this year, as well as tighter integration with OS X Mountain Lion.